Every kid’s room begs for a quiet corner, right? 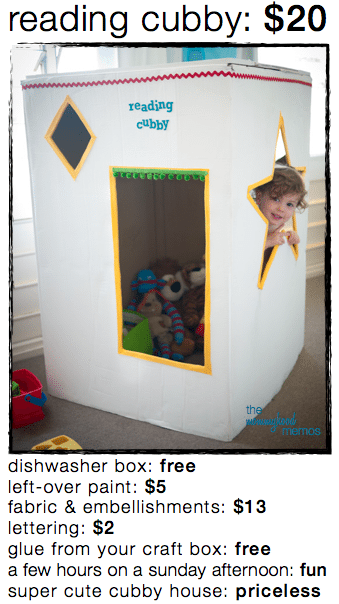 How about transforming that old dishwasher box into a reading cubby or a playhouse or a fort?! It’s the middle of summer here… which also means the middle of rainy season. That means we have to get creative with our indoor play. 1) Draw windows and doors on your cardboard box with a marker before cutting with a stanley knife. 2) Cut the windows out, making sure to leave plenty of box “in tact” so it won’t compromise the structure or end up flimsy. 3) Paint the box! You can skip this step if you want, but I found that a simple coat of paint or two transforms the whole thing. We had some leftover white paint in the garage from another project and it did the job perfectly. 4) Decorate the box by trimming the windows, drawing or painting on it (or let the kids do it themselves! ), or adding names or words. 5) Make it cozy inside with few stuffed animals, a small container of books, a pillow, and a flashlight. 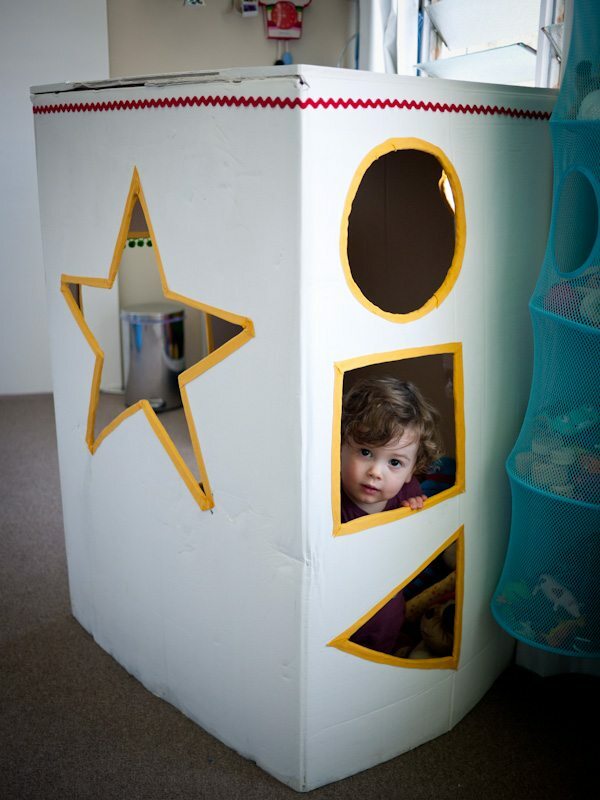 There you have it – an easy-peasy little cubby house or quiet corner that your kids will love! 1) I wanted to use fun shapes for the windows so I used a star, diamond, square, heart, and circle. The corners of the star and the rounded heart and circle were harder to trim than the others for obvious reasons. To keep it even simpler, stick with squares and diamonds and rectangles. 2) Cut in the base of the door above the floor (as pictured). If you cut it all the way through to the ground, the box will be much less sturdy. 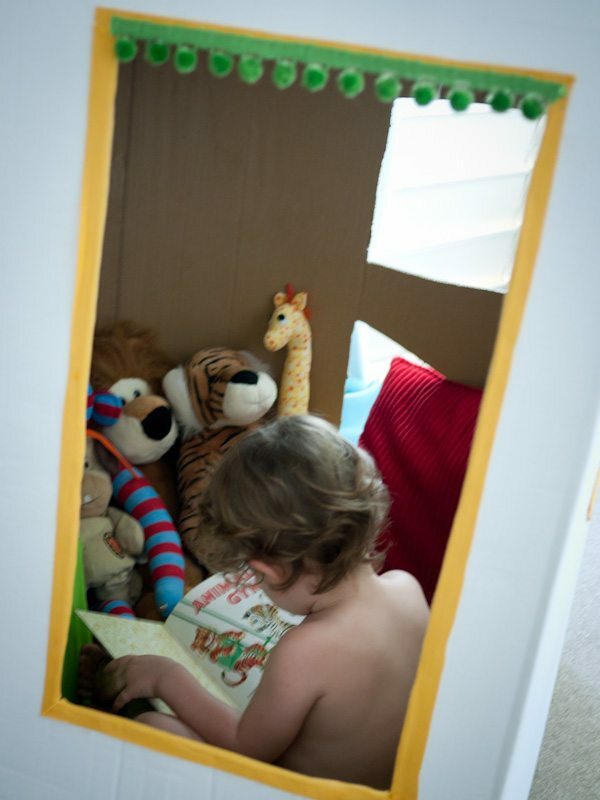 Dear friends, did you have a cardboard box cubby house when you were a kid? I sure did! I hope you and your littles can make a fun reading cubby or quiet corner together sometime soon. Tell me, will you stick with a house-type cubby? 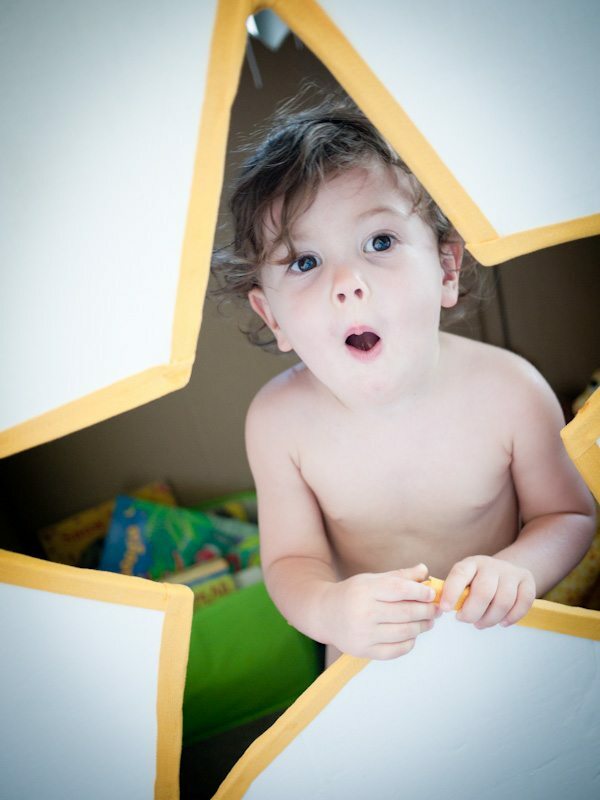 Or will you get adventurous and build a ship or rocket or another fun cubby? When we got our dishwasher this fall the kids played with that box for hours and hours. They would sit in the bottom of it and we would spin them around, or crawl in their “cave” to hide, or just bring toys in to play. We had it in the corner of our living room for about three months before it finally kicked it. Great entertainment! i had a massive refrigerator box in my room for a long time as a kid. i had it decorated as a “house” and i LOVED it. i think that was my first ever home decorating project. haha. love that kids can have so much fun with something so simple! I love this idea, Adriel! So clever!